There are at least three of you out there who have already started a bag of clothes to bring to the clothing swap. Yeah, we love you, too. Gathering activities rely on the interest of WisCon attendees hosting and organizing them. That’s you! But how do you run a Gathering activity? Submit a proposal: this year we have a handy, easy form for you to fill out! Proposals made before April 1st will be considered for the coming WisCon—after that we’ll put them in our pocket for WisCon 43! Our gathering planners will let you know if we’ll be able to host your activity shortly after you apply. We particularly welcome activities that de-center whiteness, emphasize inclusion among new WisCon attendees, and highlight our theme. Make it happen: Generally the amount of pre-planning required is quite low, and you can often find help making it happen from cool people on your favorite forms of social media. (Hint—WisCon twitter is always happy to signal boost planning calls!) WisCon may be able to make small purchases of supplies like stickers to make your activity work—just ask! Please note that we are not able to bring in outside food for activities due to our agreement with the hotel. At-Con: Show up between 12 & 12:30pm to set up your activity! We ask that you either stay at the Gathering to make sure that your activity is continuing or recruit some trustworthy friends to help out. This is a great way to talk to new people and meet new faces, if that’s your thing! And time spent running your activity counts towards your volunteer refund hours. That’s it! Really pretty easy stuff and always, always appreciated. We look forward to the fresh, fantastic ideas that you all come up with every year, as well as the activities we anticipate year after year! So click over to the proposal page, sign up, and we’ll see you in May! The Gathering is the official opening to WisCon. On Friday afternoon the ballroom on the 2nd floor of the Concourse Hotel turns into a fair of sorts. Activities range from a Scavenger Hunt to Tabletop Games to a Nail Polish Swap to a Fiber Circle. It’s a fun, laid-back way to ease (or jump!) into just the right mindset for a WisCon weekend. This year we need a few more volunteers to help make the Gathering come to life. Would you like to accumulate time toward earning a rebate on your membership cost? Would you like to help WisCon members look fabulous? Join us as a Gathering volunteer! 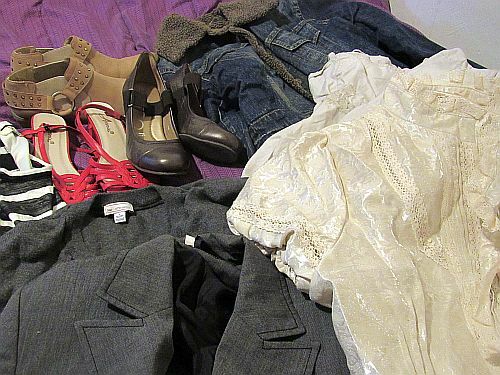 Urgent — Clothing Swap seeks fashion mavens! 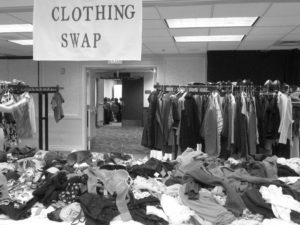 The Clothing Swap at WisCon 40’s Gathering. Our Clothing Swap is the only Gathering activity that isn’t run by the folks who propose it — because it’s so popular that we just keep holding it no matter what! That means we need YOU… to help out at the Clothing Swap. We’re in search of at least two people who love recommending clothes and giving opinions about what would look great on folks — but who also are willing to hang, sort, and set out the clothes that members bring in to gift to each other prior to the opening of the Gathering. Interested? Give us a holler at chair@wiscon.net and we’ll make sure you get first crack at the treasures. For people new to WisCon, the Gathering is their very first look at what WisCon is like — and for folks who have been to WisCon before, it’s a welcome time to find people they haven’t seen in a year, to catch up, and to relax with one of the diversions that the Gathering has to offer! Those experiences make the Gathering, the official start of the convention, an important event at every WisCon. A defining event, just as much as our Opening Ceremonies. WisCon is a feminist convention, and we believe that means not just “diversity,” but inclusion and centering marginalized identities, including identities around race, gender, class, and ability. The Gathering must reflect that as well. We are currently seeking a lead for the WisCon 41 Gathering. The Gathering lead is part of the WisCon Concom and is automatically eligible to opt for a WisCon membership rebate of 40% of the registration fee, meaning that if you register for WisCon as an adult, you can opt to receive $20 of your $50 membership back after the con ends. You need not be local to Madison, but should be planning to attend WisCon 41. In particular, we are seeking applicants from traditionally underrepresented or marginalized identities. Your role will include some planning prior to the convention, doable in a few hours a month during March, April, and May. You will determine what activities will be held from the applications you receive, communicate with the people running those activities, and solicit other activities as necessary. During the convention you will be on hand when the Gathering space is set up Friday morning and will be present during the event itself. The Gathering has many returning events this year, along with some new ones. Thirteen activities in all! Swaps old and new rely on your donations. Per usual, please bring clean clothing you’d like to get rid of at the Clothing Swap — and continuing a new tradition started last year, bring any good-condition bottles of nail polish you’d like to get rid of at the Nail Polish Swap. Finally, this year we’ll have a Book Swap for the first time at the Gathering. If you’ve ever had a book that you read, loved, wanted to get rid of, but hesitated after thinking, “This needs to go to a WisCon person…”, bring that book along! [Bonus: You’ll have room for the books you buy at WisCon in your suitcase!] Feminist sf/f especially welcome. For all three swaps — clothing, nail polish, and books — you are welcome to peruse and take things home with you even if you don’t have anything to donate. In the feminist utopia there is no currency!! In addition to swaps, the Fiber Circle returns for those who knit, spin, crochet, and so forth. The concom’s Anti-Abuse Team will be available to answer questions you might have while also providing some social justice coloring materials. We’ve also got a non-themed Coloring Table — bring any favorite coloring pages or supplies! Steven Universe fans — you can Create Your Own Gemsona! And we’ll also have Tarot Readings, Fancy Hair Braiding, and Temporary Tattoos. WisCon’s Gaming team will staffing the Puzzling! table, where you can work on jigsaw puzzles. You can also talk to them about gaming that will be held later in the convention, or maybe even sign up for an RPG. As always, the Tiptree Auction Preview will be happening at the Gathering so you can you can view and write bids. This year, Space Babe blasters are happening. Aww, yiss. Pew! Pew! Pew! ZAP!! Take THAT, kyriarchy! And, of course, we’ll have Coffee, Tea, and Subversion — this year hosted by the SF3 Fundraising Committee, who will be doing their best to subvert you to the cause of WisCon’s Member Assistance Fund. Come join us at the start of WisCon — find old friends, make new ones, or just bask in the atmosphere of like-minded feminist sf/f fans. It’s a warm start to a great weekend. The Gathering is the official start to WisCon — Friday at 1pm sharp! This is the time and place to decompress from the rigors of travel, meet friends old and new, make the transition to WisCon space-time, and get into the WisCon frame of mind! Refreshments, fun activities, and relaxation all await you at the Gathering. We also share information about the convention — and you won’t want to miss the crowning of the Tiptree Award Winner! Don’t need it? Pack it! This savvy WisCon member packed up some clothes to donate to the Gathering. Don’t forget to pack some awesome clothes for the WisCon clothing swap, happening at the Gathering from 1 pm to 3:45 pm Friday! All clothes remaining at the end of the Gathering will be donated to the Community Action Coalition. New this year — the WisCon Gathering will be hosting a nail polish swap! Bring some unloved but good-condition bottles & find new colors! Feel free to take a bottle home even if you don’t bring one. eCube #7 is now available online. Gathering apprentices needed: The soon-to-retire Gathering coordinators are looking for apprentices to learn the ropes from this year’s Gathering coordinators in preparation for taking over for WisCon 34. You don’t have to be located in Madison to do the job, but you do need to arrive at the convention in time to begin set-up at 9am on Friday. The Gathering Coordinators’ duties include recruiting participants to do activities during the event, working with Programming to ensure all participants are listed in the database, working with the Volunteer Coordinator to get volunteers to help staff the event, working with the hotel liaison to order food and tables, writing an article or two for eCube and the program book, creating flyers, maps, and passports for the event, ordering prizes for attendees, and onsite set-up and tear-down. It’s easy to do the job out of state since the prep work is done via email. Once you’re onsite, the job is completely done before Opening Ceremonies, so you are free to enjoy the rest of the convention. Plus, you get a sneak peak and first pick at Galley table and Clothing Swap! If you are interested, please let us know via gathering@wiscon.net.